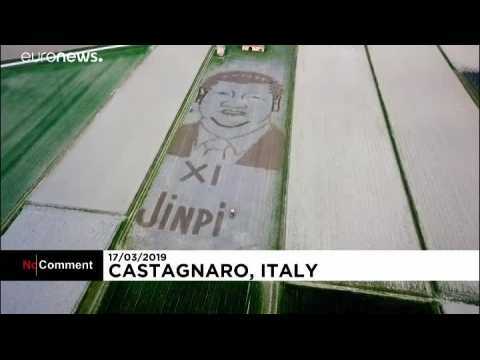 If you happen to be flying over Italy's Verona region, you might see a giant work of art in honor of the Rio Olympics from the sky. "Land artist" Dario Gambarin paid tribute to the upcoming Olympics in Rio on Tuesday, by carving a huge earth mural in a field that stretches for nearly 600 feet. The artwork depicts Rio's Christ the Redeemer statue holding five Olympic rings just in time for the Rio Olympics opening ceremony on August 6. While heavy rains in Rio de Janeiro delay the opening of the city's giant annual Carnival, thousands of dancers from elite samba schools roll out their traditional parades of feathers and sequins. Treats, fruits and vegetables that cover up far-right symbols. This is the speciality of Italian street artist Cibo, the alias of Pier Paolo Spinazze, a 36-year-old Italian from Verona. An inflatable igloo was stolen in New York City over a week ago, and now its owner and creator, Brooklyn artist Tom Montaglione, wants it back. Montaglione has described the igloo, which can fit up to 50 people, as like a sanctuary for people to listen to music and “escape the world a little bit.” The portable sound stage was taken from Montaglione’s van after he reportedly parked near the Kosciuszko Public Pool. When filled, the igloo can rise to over 16 feet high stretch, 32 feet wide and weigh over 300 pounds.